Freeform has released promotional photos and an official synopsis for the seventh episode in Shadowhunters‘ second season. The episode, titled “How Are Thou Fallen,” finds Clary and Luke conflicting over Luke’s sister Cleo, as well as Simon and Maia meeting for the first time. 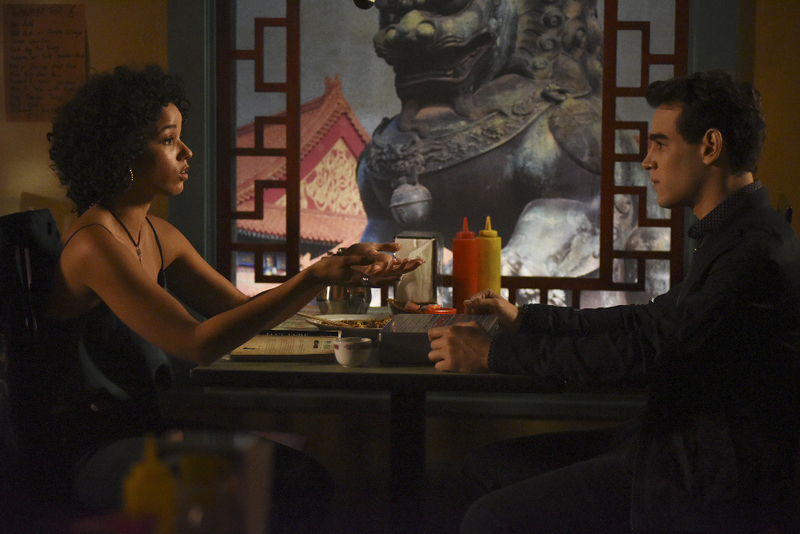 Here are the stills for the episode airing Feb. 13, which features some nice Malec shots, as well as Simon and Maia’s first adorable meeting. SHADOWHUNTERS – “How Are Thou Fallen” – Clary and Luke find themselves at odds over Cleo in “How Are Thou Fallen,” an all new episode of “Shadowhunters,” airing MONDAY, FEBRUARY 13 (8:00 – 9:00 PM EDT) on Freeform. (Freeform/John Medland) MATTHEW DADDARIO, HARRY SHUM JR.
SHADOWHUNTERS – “How Are Thou Fallen” – Clary and Luke find themselves at odds over Cleo in “How Are Thou Fallen,” an all new episode of “Shadowhunters,” airing MONDAY, FEBRUARY 13 (8:00 – 9:00 PM EDT) on Freeform. (Freeform/John Medland) HARRY SHUM JR.
Luke’s sister shows up at the Jade Wolf claiming innocence about the recent attack. But with Luke not trusting a word Cleo says, he finds himself at odds with Clary who sees an opportunity to get to Valentine. Yet how far will Clary go to prove she is right about Cleo? Meanwhile, Simon gets dating advice from a surprising source as Isabelle takes a dangerous path.